Near Temple Street Night Market, paraded between the Government Services Building and the Tin Hau Temple Complex in Kowloon, fortune tellers set their flashy tents in a long row, waiting for customers and swagging TV appearances in the meantime. 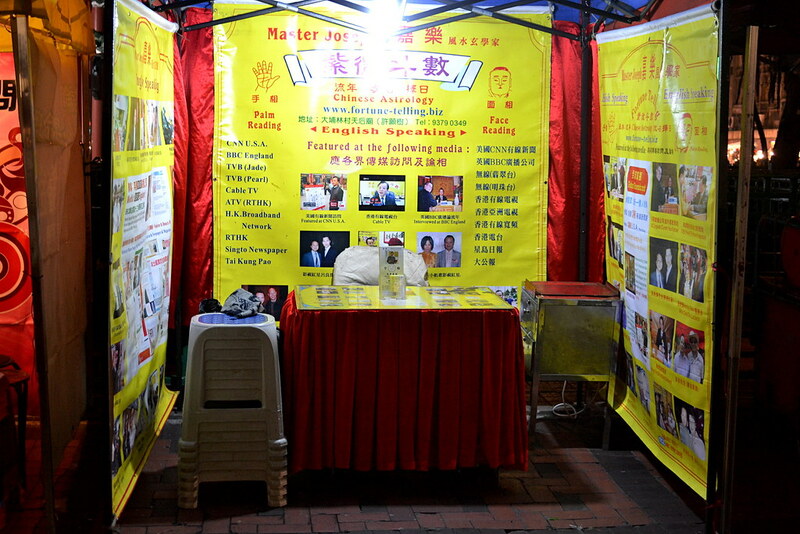 To find these diviners, walk along the Temple Street Night Market until you reach Tin Hau Temple gardens. 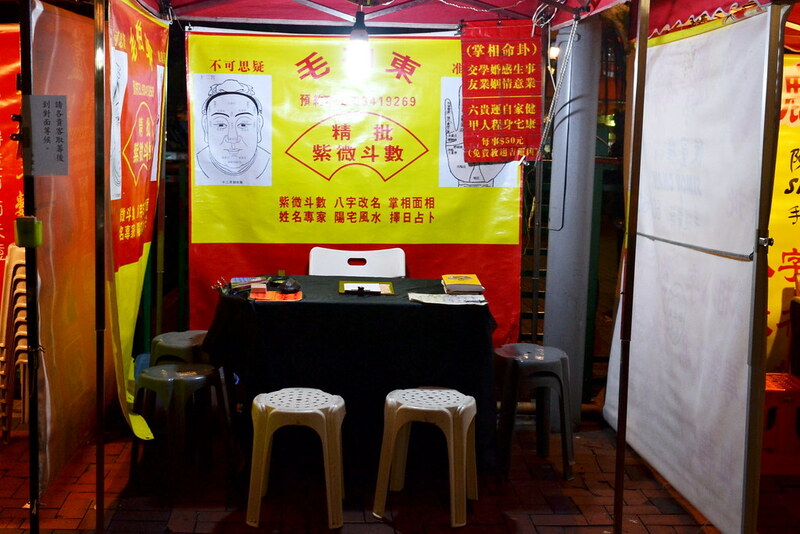 In these stalls, they perform one or several of the Chinese fortune reading methods, sometimes mixed up with western practices like tarot or astrology infused with the Chinese zodiac. The bird: a caged bird plucks a card from a pile, where there’s your fortune written in a cryptic and poetic way, which has to be interpreted by the fortuneteller. Fortune sticks (求簽, kau chim): despite this practice is mostly performed at Taoist or Buddhist temples, street fortune tellers have adopted it as well, thanks to their proximity to the Tin Hau temple. A bamboo tube with 100 flat sticks with a number on them is shaken, usually tipped slightly downward, so at least one falls off. I have to remark that only one stick falls from the tube. Each stick represents the answer to a previously made question during the shaking of the cylinder and has to be interpreted. Palm reading (手相): another classic, where the hand’s lines represent several aspects of life. Coin tossing, known as Yi Jing or Zhou Yi (周易). Bazi (八字): the Four Pillars of Destiny, involves four elements of the asker’s time (the hour, day, month and year of birth). And a long list of apparently ‘random’ methods ranging from numerology, ancient books, Chinese zodiac, some of them are just patching few together. 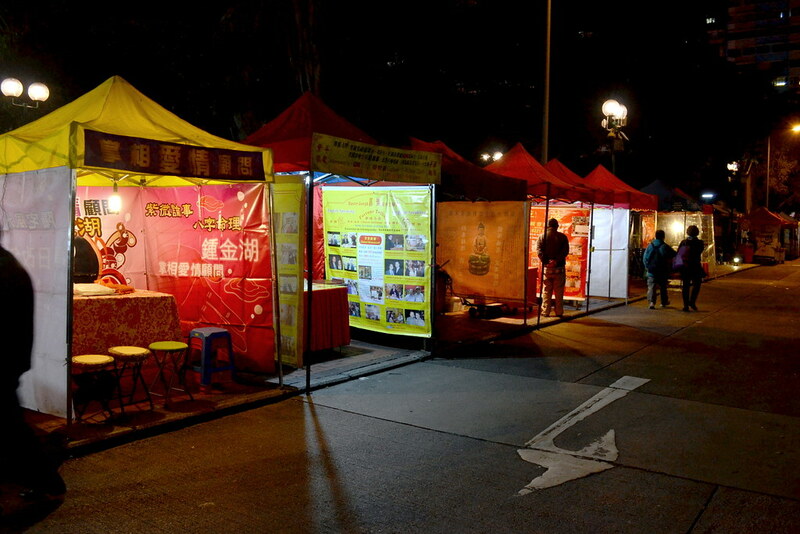 From my experience, these Chinese fortune tellers are not happy having foreigners lurk around their tents, and some will reject you with inflated prices or just ignoring any request. They do not like being treated as a touristic attraction, as locals take their predictions damn seriously. Take into account that fortune telling is part of the Chinese culture, and it is called suan ming (算命, literally ‘fate calculating’), a practice carried through dynasties and generations and thus, an important part of the social and business culture, to the point that some companies will have a diviner to assess them as if they were actual business consultants, with input on the company’s decisions, just as particulars take their job, love and health advices as seriously as a westerner would take a psychologist’s. There are many temples dedicated to Tin Hau, and you can explore Kowloon’s with Google Street view. Many Hong Kong’s temples are administered by the Chinese Temples Committee, where you can learn about the deities, locations, events and way more!